Simply put, the lack of recovery in housing demand is directly related to the a lack of recovery in real median income and growth in year over year average hourly wages. Yet many have failed to recognize how important wages and liquid assets are to creating real demand in the housing market. This, in spite of the preponderance of evidence presented to us from the likes of the distinguished and insightful Professor Anthony Sanders who has provided pictorial analyses of this issue, such as the chart below. Three other important indicators, which typically drive an increase in home purchases, rising rents, rising housing inventory and lower mortgage rates, in this climate seem to have no effect – signaling a fundamental softness in the housing market in 2014. – Rising rents: Even with rents consistently rising in most markets demand for housing from the mortgage buyer remains soft. The buying a home is cheaper than renting thesis sounds good, but didn’t work out too well in this cycle. 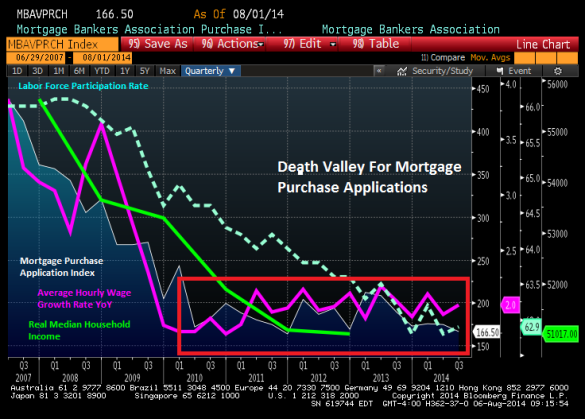 Mortgage buyers have been below historical norms through out this housing cycle. – Rising Inventory: Even with more homes on the market this year than last year, demand for housing from the mortgage buyer & the cash buyer has been less year over year. On a positive note we are seeing a cooling off on price gains and this is a good factor for the housing market, not a bad one. – Lower Mortgage Rates: Even with mortgage interest rates falling from Jan 1, 2014, demand for housing from the mortgage buyer has been negative year over year all year long. The 10 year is yielding a whopping 2.34% as of the close of August 15, 2014. We have taken back the Taper Tantrum of 2013, but with home prices still rising the total cost of a home is still higher even with mortgage rates being the same. When three economic factors that have historically driven buyers into the market are having little to no effect, one must suspect a significant change in the economic fundamentals. Low wages, a buildup of household debt and a lack of liquid assets combined with increasing purchase prices for homes means many if not most Americans cannot afford to buy. Until wages grow, liquid assets get built up and home price gains cool down, it’s going to be a long slow climb for the housing market. As I discussed in the recent article published in Origination News, lending standards cannot be blamed for the soft housing. We simply do not have enough qualified home buyers – ie those with sufficient income for both the down payment and the monthly mortgage expense plus tax and insurance. If you want a strong housing market you need Main Street America to have the capacity to own the debt of housing. The housing market must be less reliant on cash buyers and the wealthy. It needs a big dose of Main Street America participation to see year over year growth in existing home sales again. For that to happen, it will require more income & liquid assets and not easing of lending standards. Posted in Uncategorized and tagged CNBC, Debt-to-income, DIana Olick, Home Sales, Mortgage Purchase Applications, Mortgage Rates, Real Median Income, Rising Inventory, Wage Growth. Bookmark the permalink. Brilliant analysis Maestro Mohtashami ! @ House Referee.com, This week’s headline for the e-newspaper “South County Home Price News” reads: Buyers & Bankers Blame Barney. This post of yours clearly shows the true cause of this housing malaise. Investors distorted the prices of housing. The banks got rid of their REOs, and bad loans, so now the housing market can collapse again because the new mortgages they made can withstand a decline in prices. I don’t see a collapse happening until we get a recession because we have all capacity owners in this cycle. To get a massive price decline you would need a distress market of new homes going into delinquencies which I don’t see happening until we see a job loss recession. This is one of (sadly) few articles I found that support my thesis and months-long RE market analysis.. I have been watching and analyzing the housing market in our state (IL) for two years now, day in and out. I have access to MLS (I’m not an agent though) and constantly run comp analysis contemplating whether to buy or not. I come to the same conclusion over and over again watching home prices decline significantly — this is not the time to buy a home, at least not in IL. Home prices are slowly, but surely dipping to the pre-2001, fabricated pre-pricing-boom levels and yes, the seniors and the wealth-y(-ier) are refusing to believe that.. We have the real estate agents and media to thank for that — doing a good job feeding them lies and not economic facts. Most, even those better off, are too busy or simply too lazy, or even too spoiled to do their own research hence those in the middle class who would qualify to purchase a home are waiting for the market to stabilize and yes, for home prices to rightfully and significantly drop. Mind you, these now “qualified buyers” middle-income buyers are also those who have already lost significant share of their wealth and capital in the past decade, and now carefully evaluate their new purchasing power, weighing many options not to lose again. Sounds reasonable and begs the question:… is there a job loss recession on the near horizon? We publish an e-newspaper called “The South County Home Price News”. Past installments have quoted Logan extensively. All Real Estate is local. We have tracked 10 representative properties (Orange County CA) since the beginning of the Great Recession. As Logan’s story unfolds, readers will see price fluctuations of 10 representative homes in Orange County California. Chances are good that Logan’s story line will be validated by our weekly updates.